This week was...not the best when it comes to working out and clean eating. We were running around most of the week, getting paperwork in order, going house hunting for two days, filling out forms, and have guests over. I went to my typical spin classes, but got lazy when it came to strength training. To be honest, I had worked out six days in a row (last Wednesday-Monday), and was a little burnt out. I also wasn't great about not snacking on sweets and ordering healthier options while we were out running around. 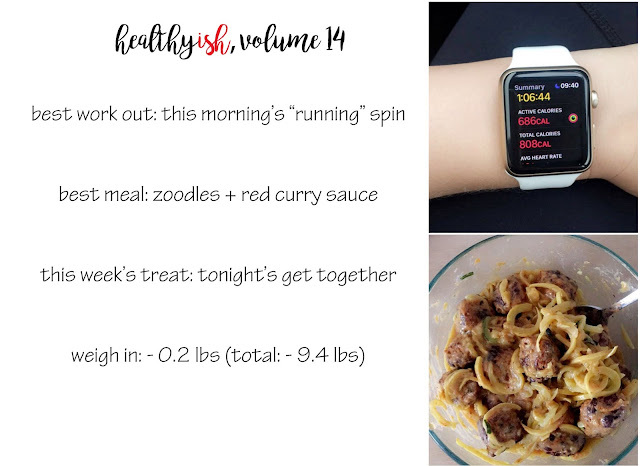 This really was an example of how you can't out-exercise a bad diet, which is why I'm changing my weekly goals from three to just one this week. I've found myself half-assing the three goals, instead of really just focusing on one. So this week, I'm making just one goal, and I hope that helps me with sticking to it. I did like half of each of last's week's goals. I stretched some days, I drank 3 bottles of water some days, and I tracked my meals some days. This upcoming week, my only goal is to cut out sugar for the week. I've always been a savory person more than a sweets person, but I found myself eating more sugar this week than usual. I'd like to really cut out the sugar for the next week and focus on eating healthier snacks in between meals so I'm not as tempted by the gummies when I'm hungry. weigh in: -0.2 lbs (total: -9.4 lbs) I was really hoping to hit the 10 lb mark this week, but I knew half way through the week that this week was not going to be the one. figuring out my "interior design" style...help?